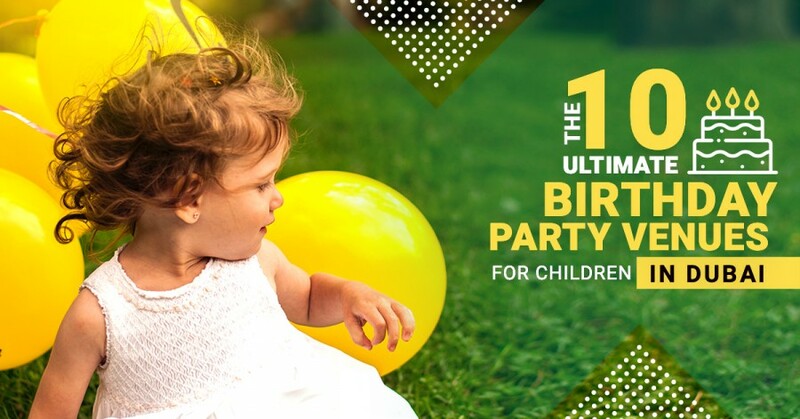 If the planning of your child's birthday bash is firmly on your agenda this year, you’d do well to take note of these 10 most incredible birthday party venues for children in Dubai, whose birthday packages are full of options to help you out – no matter what the request. Entering the Aquaduck recreational playground is like stepping through the doors of a wonderful splashing oasis in the centre of the city. Taking the idea of ‘bringing the water wonderland in’ to the extreme, Aquaduck Water Park has helped to create thousands of unforgettable children's birthday parties, which complete with water-mazing adventure of slides, water cannons, wheels, flume, tunnel, tilting bucket – are just a few of the highlights of their facilities. Karaoke and Disco arranging parties are also a regular feature here. Not to mention, you get a professional entertainer and party host as a part of a range of packages tailored to the birthday child. Birthday boys and girls can celebrate their big day at the Indoor Clubhouse or have an Outdoor splash party. With packages offering a choice of themes, other perks for 3-14 age group include a 2-hour party, followed by a Bad Science show, fun activities, games and bouncy play alongside the delicious kids meal, invitation cards, decoration and set up. Theme options for the indoor bash vary from Aquaduck artsy crafty party, Hollywood rockstar, glitz & glam princess, hero squad, glow in the dark karaoke, Aquaduck upgrade & customised to water park mad science for kids. The Outdoor splash party is sure to be a hit. From a splash regular party to an aqua aloha, surf & turf, treasure island pirates, mystical under the sea parties, Aquaduck is the ultimate spoiling feast for your kids. Address: Villa No. 6, Street 33, Al Mankhool Road (next to ADCB Metro exit 2), Dubai. Thanks to a winning combination of 8 interactive fun-filled galleries, exhibitions, world-class experiential playground, La Petite Treehouse Cafe for parents, the OliOli has enjoyed its most successful year yet – so much so that it got the top spot to claim the accolade of the Best Edutainment Venue 2018 in Dubai and also 5-star rating at TripAdvisor. OliOli has become the most talked about children's entertainment venue to make your child's birthday party a success. From a chance to have enriching play experience, tones of fun in a highly creative environment to extensive kids' and adult's menu, this unique children's museum is offering the ideal space for both parents and your little guests. All the party packages include from 1.5 to 2.5 hours of play time and 30 minutes for children's healthy yummy food, along a decorated private party room, personalised electronic invitations, dedicated party facilitator, plus 30-minute add-on workshops are also available. We would highly recommend a range of workshops for your kid's party from Slim Factory and Epic Superhero to Whimsical Unicorn and Marvellous Masterpiece. All workshops will be lead by your party host and an additional educator and will be added to the party package of your choice. Address: OliOli Building, Al Quoz 1, Next to Oasis Centre, Dubai. 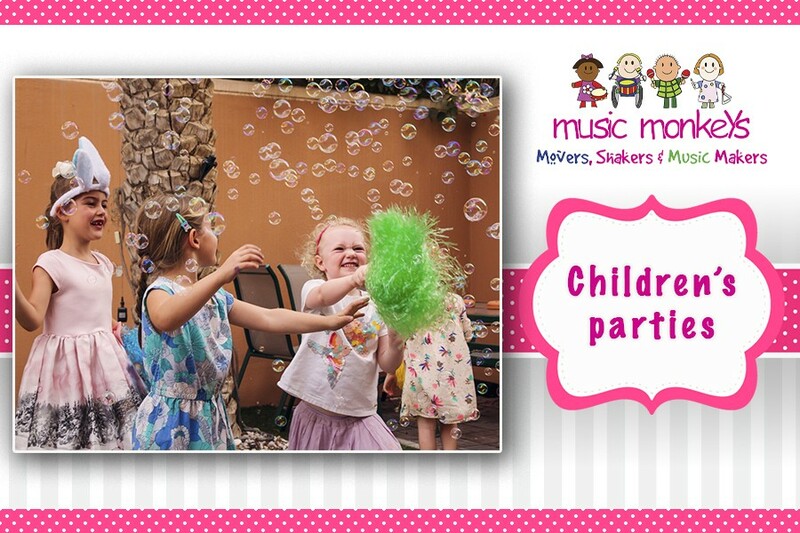 Your little ones will love the chance to have a truly energetic themed birthday party provided by the Music Monkeys team. Catering for kids from one to five years old, Music Monkeys always challenge perfection and think of new ways to embrace your child's personality. With that in mind, each party is individually tailored to fit the birthday kid’s personal taste, favourite songs and musical instruments so the day is completely theirs. Up to 30 children can be kept amused by their female party host enjoying singing, dancing and acting along with a diverse range of age-appropriate games, all-time favourite bubbles and parachute in any location including your home. With a strong focus on bright and bold children's entertainment, Music Monkeys also offers games for older children, as well as face painting & ballon bending at an additional cost. The party packages cover a qualified birthday leader for 45-60 minutes of the theme related musical activities, a gift and certificate for a birthday kid, prizes for children aged 3 and up when they play games. To guarantee the date and time that you require, it is better to book 6 weeks prior to your party date. Venues: they can recommend venues if required. With so much on offer, Playdates prides itself on their interactive learning playground, which is ideal for your kid’s birthday bash. The ultimate birthday party packages are thoroughly enjoyable for youngsters aged between 6 months to 6 years old. Its variable play areas, safe supervised indoor maze with spectacular slides, passages and winding tunnels are a must-have at every child’s birthday party. Playdates did not forget about little kiddos, as it has the soft play area for toddlers up to 2 years old. They also provide birthday party activities in the comfort of your home. From clowns, face painters, animators, balloon benders, cotton candy or popcorn machines to puppet or comedy children’s show – your little guests will never be at a loss for things to do. Address: Playdates Palm, RT- 15 Building 5, Golden Mile 1, Palm Jumeirah, Dubai. Situated in Al Barsha, Brick 4 Kidz is the world’s most popular provider of birthday parties and the most popular choice in UAE for fun-filled LEGO® bricks children’s events. With its abundance of colourful creative-play LEGO® Bricks, LEGO®-based games and activities, BRICKS 4 KIDZ’s Creativity Centre is a budding builder’s dream. Guests are spoilt for choice when it comes to a range of age-relevant themes: Bricks4Girls, Bat League, Superhero Academy, Spinning Ninjas, Mining & Crafting, Jurassic Brick Land, Transformation Creations, Brick City, Amusement Park and Brick Fusion. The three packages – DELUXE, PREMIUM or SUPREME – cover 1 or 2 party hosts, 1-hour fun building activities and plenty of games with LEGO®, creative play with tons of LEGO® bricks, e-invitations and e-thank you cards for your party guests and 30 minutes of food and cake time (you can bring your own food and cake). The SUPREME package also includes KIDZ MEAL (burger + fries + drink + pizza), branded t-shirt for the birthday child, a mini-figure factory and goody bags for all guests. Brick 4 Kidz hosts only one birthday party at a time at the Centre – so a booking with them means you have exclusive run of the Centre for the duration of your party! Address: BRICKS 4 KIDZ Creativity Centre, Office M01, Al Barsha Building, Hessa Street, Al Barsha 3, Dubai. Dedicated to making each child’s birthday go smoothly whilst actively engaging children in a wide variety of sports activities, Just Play offers ultimate birthday parties for young daredevils of all ages and abilities. The unique party options pack a powerful punch: Ninja Warrior Party, Trampoline Party, Football Party, Gymnastics Party, Dance Party, Wrestling Party. Comprising 2 hours of unlimited play in your chosen sports and in a party room, other perks for groups of kids include a birthday cake with bespoke design, invitations, food, drinks and goody bags for all guests and a qualified coach to ensure the fun safe and fun use of the facilities. A minimum of 10 kids is required to book a party. Pricing starts from AED 99 per child, depending on the day of week and the number of guests. Address: Just Play, 5 15A Street, Al Quoz 1, Dubai (just off the Sheikh Zayed Road Exit 45). Famed for a legendary 7,000 m2 scaled replica of a real city packed with over 60 role-playing activities for children aged 4-16, KidZania’s well-established reputation continues to ring true. It contains a spacious, well-decorated private party hall with a capacity of 30 kids and about 20 adults. There also is a stunning lounge area for adults to sit and watch their little ones and a seating area for kids to have their meal. KidZania is jammed with immersive entertainment for offspring, featuring all types of role-play activities throughout the city. The KidZania birthday party package includes an entry to KidZania (birthday child is free of charge), private party room for 1 hour, decorations, party host (and music), 100 KidZos and kids' meal. Meanwhile, there are optional extras of RightZKeeper appearance, birthday cake, face painting, goody bags, video and photo, pinata, balloon bending, magic show, dance performance and marching band. Pricing starts from AED 180 per child and with every 2 kids, one adult goes free. Address: Level 2, The Dubai Mall, Financial Centre Road, Downtown Dubai, Dubai. Newly renovated Dubai Bowling Centre (DBC) is a modern and spacious family entertainment centre with three main areas: a professional 16-lane bowling alley, JUMP UP ‒ hip-hop trampoline playground with a mix of activities including slam dunk, airbag, dodgeball and wall-running, and GAMES ARCADE – video gaming entertainment with a big variety of arcade games on offer: from old-school classics to new-age redemption games, rides and virtual reality. Best of all, YAMU eatery, an interactive family-friendly F&B outlet, caters to all DBC events with fun freak shakes, character-themed burgers & snacks to keep you fuelled throughout all the gaming. Give your child a soaring birthday bash choosing one of the age-appropriate, themed birthday parties complete with a range of activities, decorations, food and entertainment options such as mascots, magic shows and additional trampoline park access or bowling lessons. A dedicated expert team of party hosts takes care of each booking all the way through to ensure an event like no other! Free underground parking is available for all guests. Address: Dubai Bowling Center, Al Quoz 1, Meydan Rd. Gone are the days when Dubai was known for little more than its endless whirl of summer activities, stunning beaches, water sports and deserts. An amazing mountain-themed wintery birthday party by Ski Dubai is what everybody is talking about – and rightly so: it’s sensational for the Middle East! Get a glimpse of what it's like to throw a birthday bash in a real ski resort located in the Mall of the Emirates. At Ski Dubai the kids will get to observe and marvel at skiing, snowboarding, tobogganing, rolling down the Giant Ball run, jumping a 10ft. ramp, spiralling down the tube slides, bobsled, sightseeing in the chairlift, having a hot chocolate at -4°C and playing with a snow penguin. The vast range of packages here is a delight: Laser Tag, Snowpark, Discovery or Polar Birthday packages. All of them include a 2.5-hour party for a group of 10 and up to 25 kids, equipment and clothing rental (disposable socks, boots, trousers, jackets and helmets, skis or a snowboard), entry to the Snow Park or Arena, unlimited rides in the chairlift, giant ball and mountain thriller. You will also get a complimentary celebrant's photo with special frame, a gift for the birthday child, fleece gloves, invitation cards, goody bags, decorations, hot chocolate, 3 choices of hot food, choice of desserts, one complimentary drink and water. There are also optional extras of a birthday cake, a personal appearance by the frosty and friendly Polar Bear (Ski Dubai's Mascot), face painting, balloon bending, magic show, and a penguin mini-encounter where the birthday child gets a chance to touch the penguin. Address: Mall of the Emirates, Sheikh Zayed Road, Interchange 4, Al Barsha, Dubai. There is an endless array of possibilities for an oceanic aquarium birthday party at Dubai Aquarium & Underwater Zoo, one of the most engaging attractions in Dubai. Located at The Dubai Mall, it offers an incredible journey to an underwater life. Dubai Aquarium has the capacity to hold 10 million litres of water. It is one of the leading modern indoor aquariums in the world. It reveals the wonder of the deep sea and ocean floor, and features an incredibly diverse collection of aquatic life. The Underwater Zoo with penguins, piranhas, crabs, water rats, seahorses and jellyfish is also available for kids who like to be more hands-on in their approach to activities. Suitable for a maximum of 20 guests, children’s 2-hour birthday parties include an Otter Encounter session and activities as well as a guided tour before or after the session to visit the Aquarium Tunnel, Underwater Zoo, Glass-Bottom Boat and Underwater Observation Deck (fish feeding). Each party also encompasses a chance for the guests to meet and greet with the Otters, assist trainers with animal training behaviours, enrichment activities including making toys for the otters, rainforest and animal care themed games led by a member of the education team; and the option for party bags, kids' meal, juice and ice-cream with balloon decoration at Rainforest Café (The Dubai Mall) for an extra charge. Glass-Bottom Boat rides are not applicable for children under 3 and pregnant women. Address: The Dubai Mall, Doha Street, Off 1st Interchange - Sheikh Zayed Road.